AndScreen is an excellent utility for your Android device to capture screenshots of display screen in both system and recovery modes. 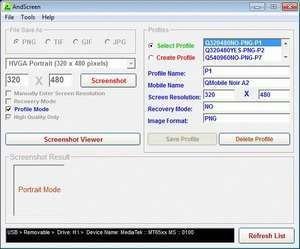 AndScreen can take screenshots in 4 different image formats like PNG, TIF, GIF, JPG. AndScreen has a built-in Screenshot Viewer with a special scrolling option for larger images. For security reasons, you should also check out the AndScreen download at LO4D.com which includes virus and malware tests. Additional screenshots of this application download may be available, too.